A Life Worth Living: Albert Camus on Our Search for Meaning and Why Happiness Is Our Moral Obligation by Maria Popova. One of the most famous opening lines of the twentieth century captures one of humanity’s most enduring philosophical challenged — the impulse at the heart of Seneca’s meditations on life and Montaigne’s timeless essays and Maya Angelou’s reflections, and a wealth of human inquiry in between. But Camus, the second-youngest recipient of the Nobel Prize in Literature after Rudyard Kipling, addressed it with unparalleled courage of conviction and insight into the irreconcilable longings of the human spirit. Read the rest of this article from Brain Pickings. Being at the right place at the right time – but DON’T move! Here’s something you don’t see everyday. A light moment in a serious sport. Professional golfer Rory McIlroy found himself in an odd spot during the second round of the 2014 Tour Championship. His tee shot on the 14th hole hit a tree and then found its way into the pocket of a spectator. What is your (reason for being) (purpose) (meaning) (why am I here) in life? “It is important for NDE research to reach mainstream society, said Holden, because the messages therein are so important. One of the lessons learned by many NDEers is that “human life has purpose,” Holden said. At some time in everyone’s life, we should (need to!) address this question. And our answers will usually be based on our cultural upbringing, religious beliefs, scientific perspectives and the personal philosophy we usually acquire as we grow older. Do you know the purpose (the real meaning) of YOUR life? So how does this question apply to you and your life? What is beyond the door of your imagination? What is holding you back from opening it? What are you afraid of seeing – of feeling – of hearing? Could it be – THE TRUTH? I think it’s time to open our doors! Parents! What to do when the kids are getting in your way! My father had a great sense of humour. 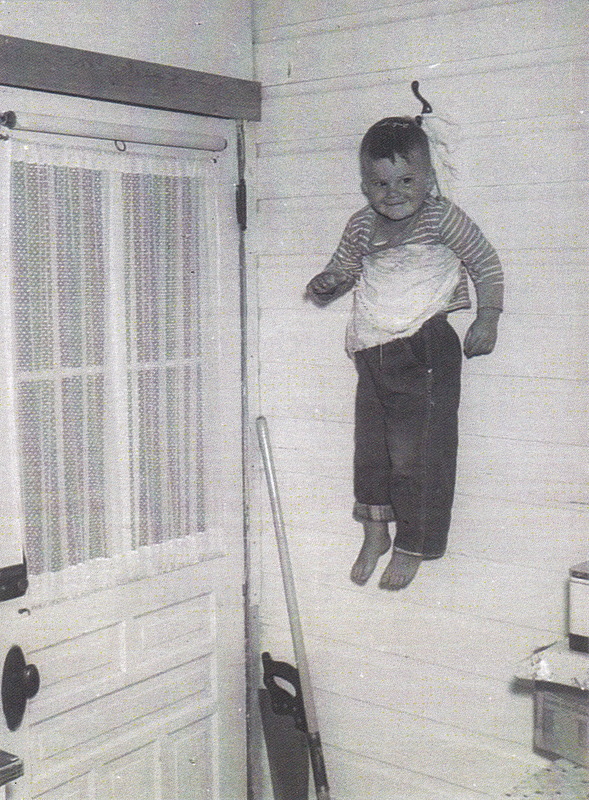 Here I am at 2 years old hanging on the wall. Judging by my facial expression, it didn’t seem to bother me at all. Hmm..like father like son. 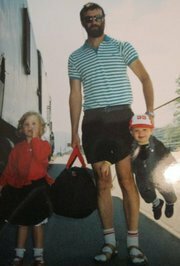 This is me (many years later) having learned a trick or two from my father. Meghan is not quite sure about this, but Andrew is enjoying every moment of it.